Once you secure a date, you can choose your own masterpiece to paint from our collection of nearly 9,000 works of art. A link will be emailed to you so that you can choose your painting! You will be able to choose from 2 hour ($35/person) or 3 hour ($45/person) paintings. (See additional info for Kid's Birthday Parties below). We schedule parties any day of the week, space permitting. We have morning, afternoon and evening slots available. You get your own private party room and your own artist-instructor. Once you choose a painting, you will be able to send invitations to your guests! Prices are the same per person as our regular open classes and no set up; no clean up - just show up! The room is yours 20 minutes before your party to celebrate. We provide all of the art supplies, as well as cups, napkins, paper plates, and corkscrews. Guests may bring decorations, drinks and snacks! The host of the party can reserve a date with a credit card by calling us at (315) 447-2733, email your request to studio233@paintingwithatwist.com, or go to our Request Party page to submit. Our Main studio will accommodate up to 50 guests and the Private studio will fit up to 24 painters. The minimum number of painters required for private parties on Friday and Saturday nights is 12. The minimum number of painters required for private parties at all other times is 10. There is a 7 day cancellation policy for private parties. The credit card will be charged a $150 cancellation fee if less than 7 days notice of cancellation is given. If the minimum painter registration is not met two days prior to the event, the host/hostess credit card will be charged the balance to meet the minimum. Once the private party has been booked and the painting is selected, the host/hostess will create a passcode to distribute to guests. Hosts can email invitations to their guests. Guests can then go online and individually pay and register for the private party, or the host/hostess may instead pay with one payment for the entire party. Host a unique party for your child's birthday, Scout Troop, sports team, or dance class! Kids love painting here and they also love our dance breaks! Plus, kids leave with their complete masterpieces, so there is no need to come back and pick them up at a later date. Kids parties can be held Monday – Thursday before 5 pm and Saturday and Sunday afternoons based on room availability. Feel free to bring along decorations for your event! Selection of a $25 (1.5 hour) painting (perfect for children 12 and under). $250 for 10 painters plus the birthday child. If this is a birthday party, the birthday child paints for FREE. One complimentary seat per party only. 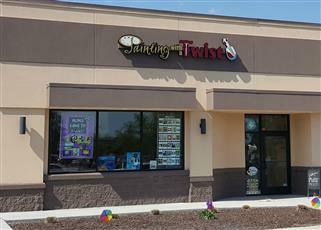 $25 for each additional painter. $50 deposit required at time of reservation. Choose either a 1.5 hour or 2 hour party. 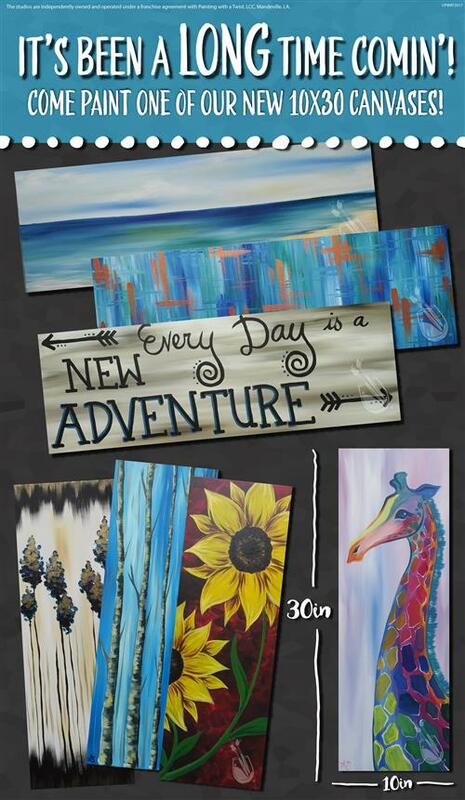 Selection of a $35 (2 hour) painting (perfect for teens and adults). $350 for 10 painters (Sunday-Thursday) or $420 for 12 painters (Friday and Saturday). If this is a birthday party, the birthday person receives a gift certificate for a future class with 10 paid reservations. $105 deposit required at time of reservation. Should you desire more time to celebrate after the class instruction is complete the charge is $50 per half hour for use of the room. This must be requested and confirmed at the time of booking for scheduling purposes and may not be able to be added on at the time of the event.